When I think of fishing and fishermen, I think idyllic streams in the Scottish Highlands where the gentle rushing of water over stones, the hum of bees and the swish of a lone fly fisher’s line blend imperceptibly into the silence; or a quaint Greek harbour where a bearded Adonis sits silently mending his nets to a background soundtrack of cicadas and the tide slapping the boards of lazily bobbing fishing boats. Cut to Tenerife where these images are shattered by the audible battles of dance music blasting from the speakers of beer stalls and the open air rave; the screams of girls being cannoned by high powered water pistols or thrown from the harbour wall into the chaotic water below; the deafening cacophony of splashing as a thousand hands churn up the harbour waters and the horns of dozens of small fishing boats as the Virgen Del Carmen ( Our Lady of Mount Carmel) takes to the waters for her annual jaunt around the bay. 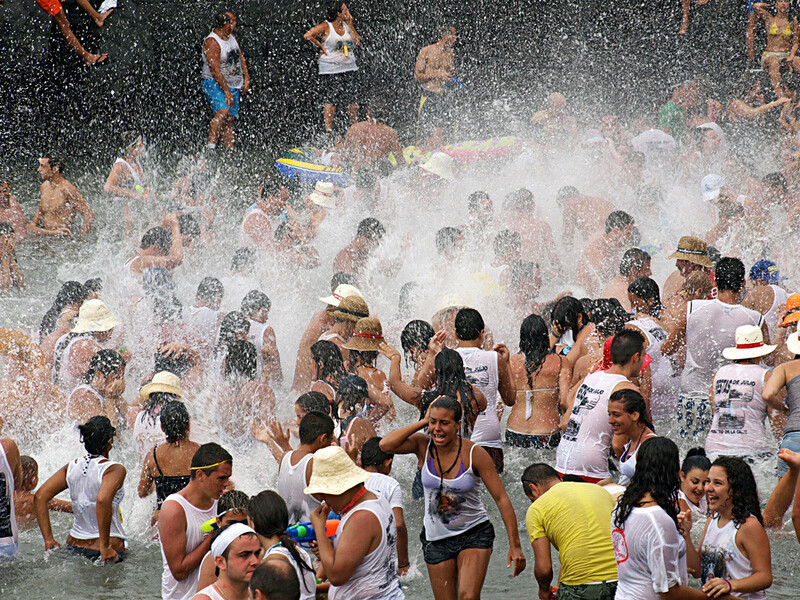 Welcome to the wild, wet, fishermen’s Fiestas Del Carmen in Puerto de la Cruz. Puerto de la Cruz may be a thriving tourist centre and one-time premier resort of Tenerife but it has never lost its fishing village roots. Arguably the prettiest natural harbour on Tenerife, Puerto is home to a strong community of fishermen and mariners. Annually they treat the Virgen Del Carmen and San Telmo (Saint Elmo), to whom they feel indebted for their livelihoods, to a trip around the bay in order to ensure safe voyages and full nets for the coming year. It’s a tradition which takes place in many of the coastal resorts of Tenerife in and around the 16th July; Virgen Del Carmen‘s Feast Day. A feature of each of them is the central role played by the fishermen who carry the statue of their Saint on their shoulders to her embarkation point, sail her around the headland and then return her safely to her permanent church home amidst fireworks and celebration. 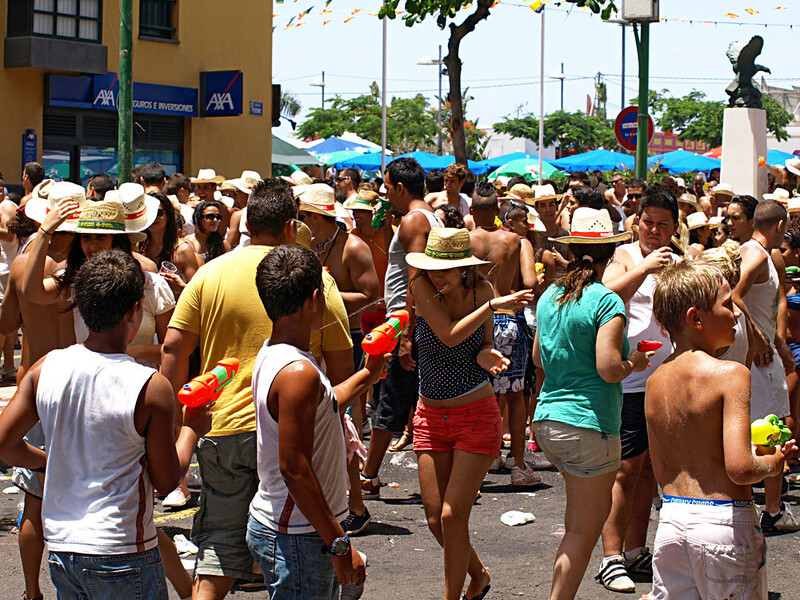 The difference with the fiesta in Puerto de la Cruz is that somewhere in the region of 35,000 – 40,000 people descend on the town for the day turning it into one of Tenerife’s biggest festivals. I have a sneaky feeling that the weather God is a fisherman at heart because in all the years I have been attending Puerto’s Fiestas Del Carmen, it has always, without exception, been a red hot, cloudless day; regardless of how many days before or after have fallen prey to the cloud that trade winds bring to the north coast in early summer. And yesterday was no exception. With Tenerife at the tail end of a heatwave, the harbour saw temperatures tipping 34ºC as the sun beat mercilessly down on the thousands of revellers who took to the harbour waters in their droves to stay cool. Those who preferred to stay on dry land had running battles with high powered water pistols turning Plaza Charco, Calle Perdomo and the Muelle into an arena of water cannon cross-fire where escaping without a soaking was not an option. With everyone heat exhausted and soaked to the skin (voluntarily or otherwise), the Virgen and San Telmo finally arrived at the harbour where they were given an emotional rendition of Ave Maria before being carried to their waiting boats. A few squeaky bum moments later they were both safely ensconced on board their vessels and heading off towards the horizon. While the party continued to rage, some of us trod our weary way homeward, safe in the knowledge that there would be fresh dorado (bream), cherne (grouper) and chiperones (small squid) for the coming year. Fiestas Del Carmen take place in Los Cristianos, Bajamar and El Médano. Some of the larger celebrations are in Santa Cruz and Las Galletas. Santa Cruz – Friday 16th July 2010 ““ a full programme of music and concerts takes place in the city centre. Mass is held at 6pm in Iglesia de la Concepcion followed by a parade of the statue of the Virgen del Carmen through the city (Plaza de España, Marina, Avenida MarÃ­tima) to the harbour at Muella Ribera (near the junction with La Rambla) for embarkation and a trip around the harbour. Fishermen lay a wreath on the water in commemoration of fallen colleagues. On the Virgen‘s return, she’s paraded back through the city and is greeted in Plaza del España by the traditional firework display. Another day of celebrations, concerts and festivities follows on Saturday 17th July 2010. 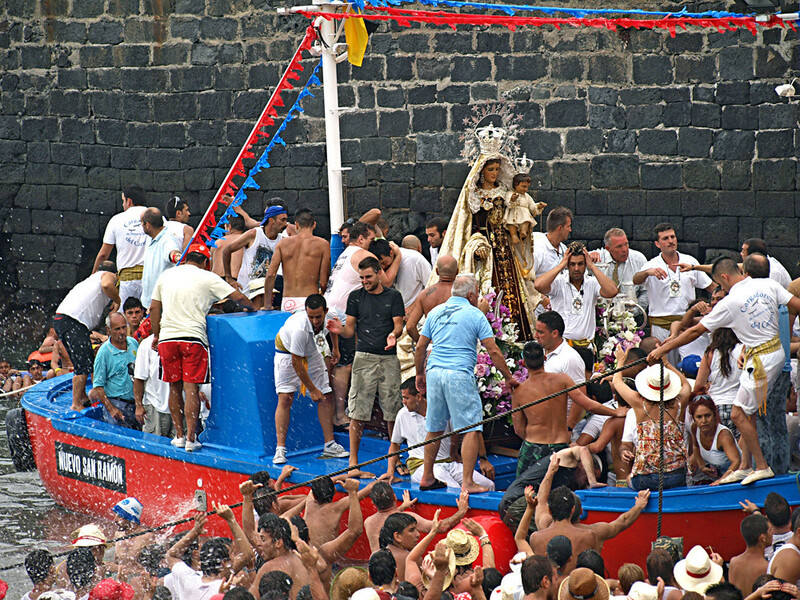 Amidst a whole week of events which includes parties with live bands from 11pm on the nights of Friday 16th, Saturday17th and Sunday 18th July 2010, the Virgen is taken to sea on Sunday 18th July amidst a noisy flotilla of small fishing boats. On her return at 9.30pm there’s a large fireworks display followed at 11pm by the final party.